I-Pilot Link turns your Minn Kota motor and Humminbird Fish Finder into a unified lake-navigating experience. Take command of your motor at any time using the Minn Kota wireless remote or your Humminbird. Lock onto spots, record and retrace paths, follow depth contours and more. You're always in control! Hands-free, responsive control exactly the way you want it. 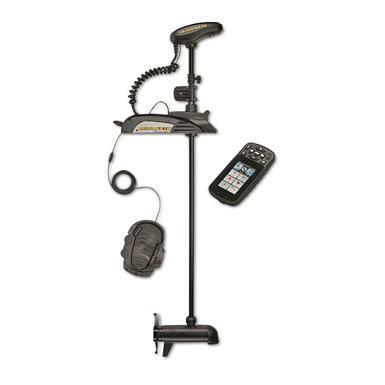 Use the customizable touchscreen remote or foot pedal for total control from anywhere in the boat. Once you've found the ultimate spot, stay there with Spot-Lock. And the entire time your hands are doing what they do best…fishing! Push-to-Test battery meter gives you an instant "state of the charge"
Take control! Order your Terrova today! Mfg. Number: 1358896 - 45"
Mfg. Number: 1358897 - 60"